Carpet Wall to Wall provides carpet resource information including manufacturing, installation, care and claims resolution. Our goal is to assist you with preventing and solving carpet problems. Carpet Wall to Wall is a service of the Weinheimer Group. Terry Weinheimer and Kevin Weinheimer are the authors of Carpet Inspectors Handbook. 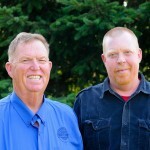 Terry and Kevin are nationally recognized floor covering consultants and certified carpet inspectors. Their services are used by commercial and residential clients – manufacturers, builders, architects, insurance companies, attorneys, home owners and others. Terry and Kevin Weinheimer are located in the state of Oregon and available for travel world-wide.